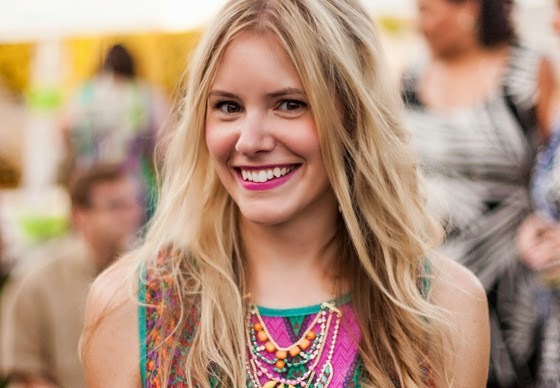 As a fellow fashion enthusiast, I am so excited to help out Julia on the blog today! I don’t work in fashion nor do I have my own blog, but I have some style street cred seen here and here. Both opportunities have let me showcase what I’m best at- the wherewithal to have great style on a small budget. A key component of that is investing in some key pieces, in this case the LBD. As a general rule of thumb, I never buy something that I can’t wear with three things I already own. But to truly create 5 different outfits?! That was a challenge. I choose H&M’s Jersey Dress. For less than $20 you can’t beat the price and I figured black can go with everything. I like that its form fitting, but since it’s black it’s forgiving where it needs to be. I also love the three quarter sleeves and knee length- it makes it appropriate for most occasions. This dress will be the hardest working item in your closet! Five different outfits? Let’s go. 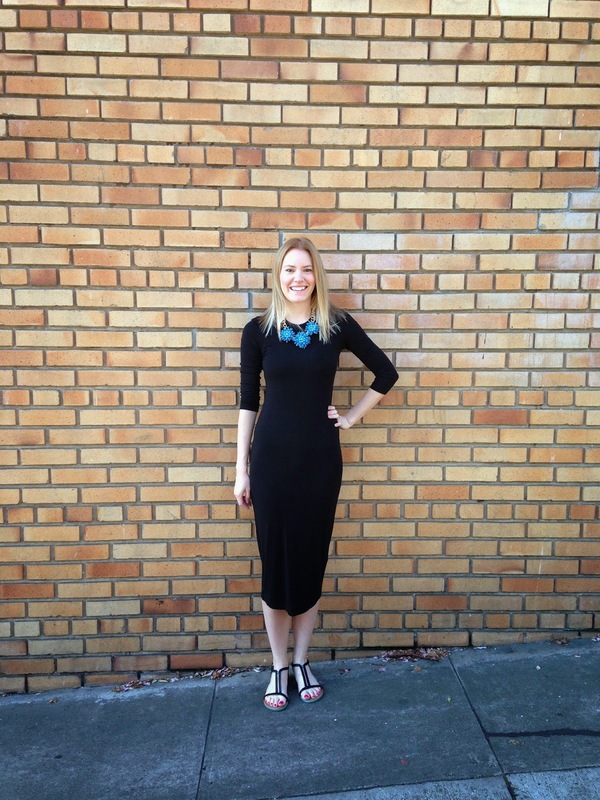 Since this is a simple black dress all you need to do is add some big baubles, and ta-da! Instant style. 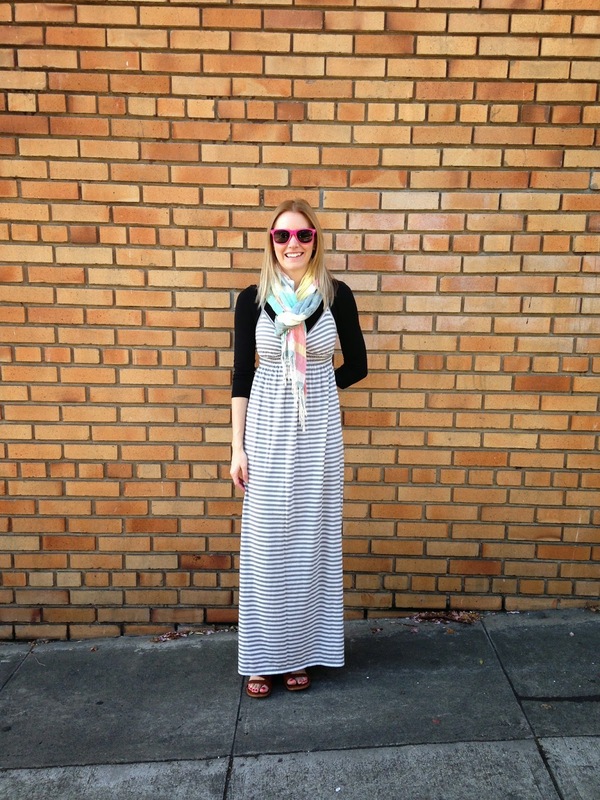 One of my favorite things about this dress is that you can dress it up, but you can totally dress it down. 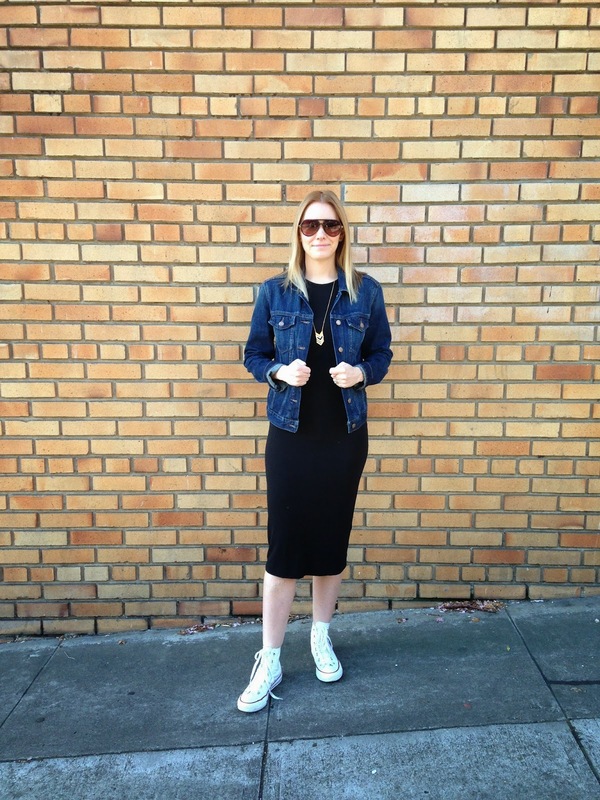 This dress instantly becomes California cool with the required converse and denim jacket combo. Aviators and a gold necklace round out the look. 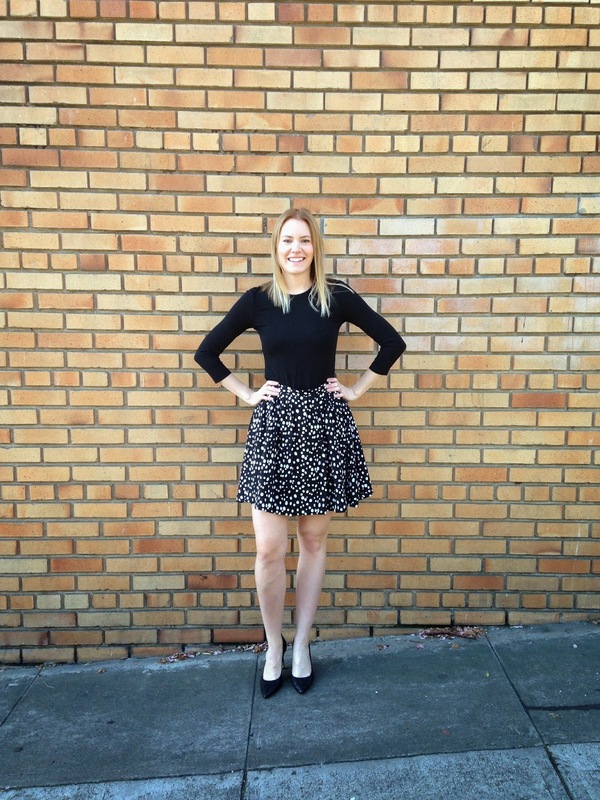 I don’t know about you- but the pencil skirt is my go-to for the business casual dress code. I always feel put together and polished. 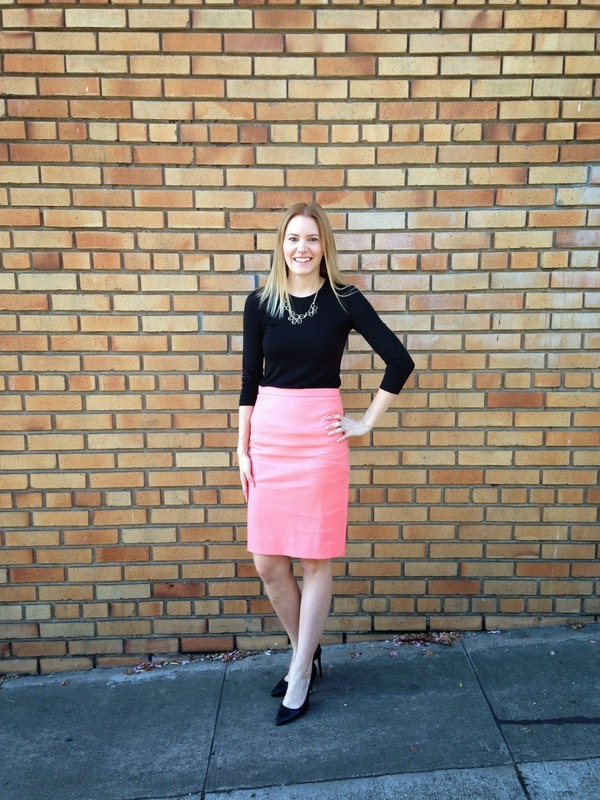 However, the pencil skirt can also be a little snug, and in this peach color it is not the most forgiving. This is where the H&M dress shines. The bottom half of the dress acts like spanx and you don’t have to worry about that awkward “shirt tucked in to your skirt” bulge that happens. Heels and necklace make it complete! When you live in San Francisco, there are more days of Karl the Fog than sunshine, so you don’t always get the opportunity to wear your beloved sundresses. Show them the light by pairing them over this LBD! Although wearing what essentially feels like a tank top over a shirt feels a little “Clarissa Explains It All” the 90s are making a comeback! And I can get behind this over overalls any day. Great ideas for a low price, love it!